Ferrari V8, no date given: These resemble the last of their V10 rods quite a bit, but the caps have the more 'modern' serrated locating feature. 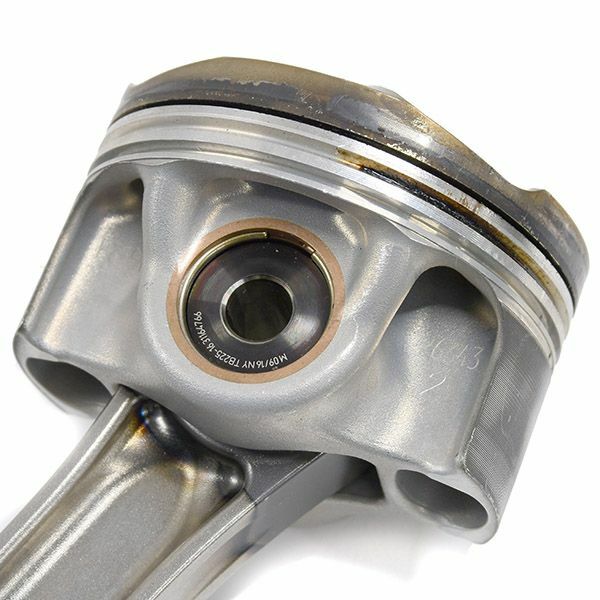 The piston is also different: Check out the windowed skirt in the sixth image. I don't recall ever having seen that feature before. Peugot V10: The first two images MUST be the older design. 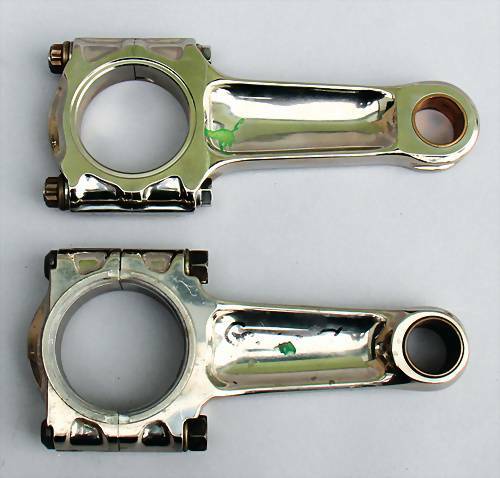 The rods in the third image are surprisingly different than the Cosworth V10 versions shown below. Honda V10: Nice research paper on the hollow rod effort here: http://www.f1-forecast.com/pdf/F1-Files ... P2_34e.pdf I don't think the hollow rods ever raced. Cosworth TJ N.A. V10: The differences shown being either different vintages or different badged teams. This thread goes deep on the Cosworth TJ rod: viewtopic.php?f=4&t=9346&hilit=Pankl+Conrod. 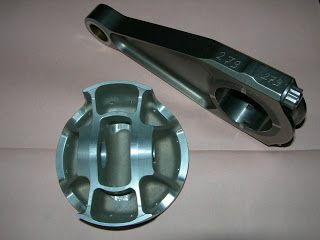 Note the difference in how the caps are machined, and how they are located. 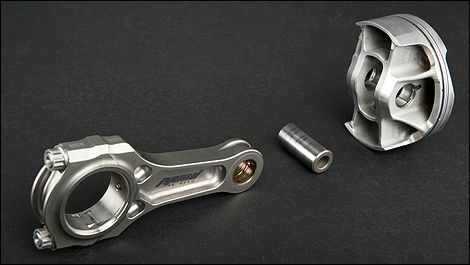 The piston is just to have something to compare to the 1.6L version above (I don't think anyone raced a full 'dlc' coated piston, so this seems like an experiment.). 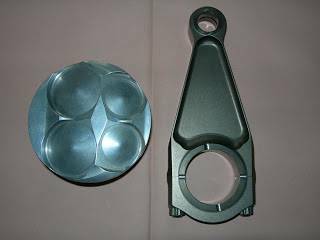 Here are some better images of the surface treatment applied to the small-end, presumably to eliminate galling when pressing the bushing in. 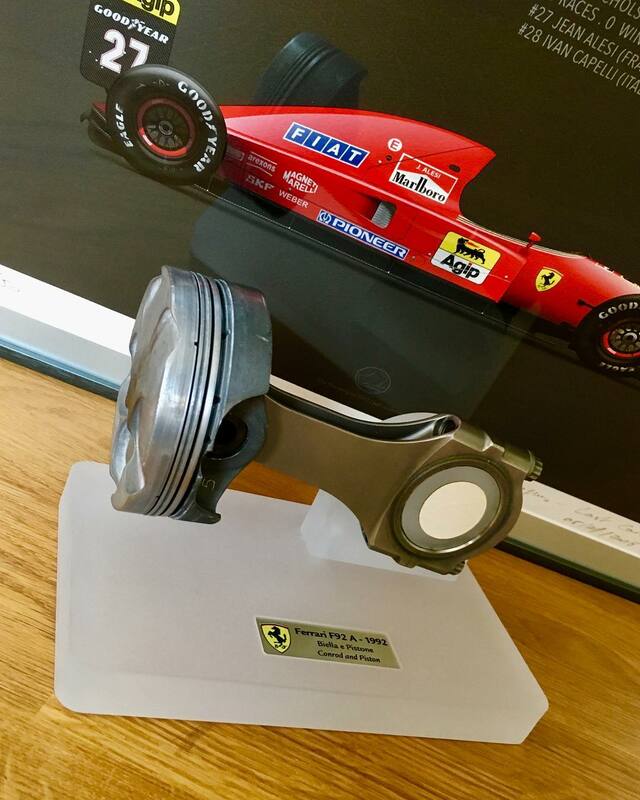 1992 Ferrari F92A, N.A. 3.5L V12: These look like steel. TAG - Porsche: At the end of its development it was hitting 1,060 hp in quali mode, @ 12,600 rpm. 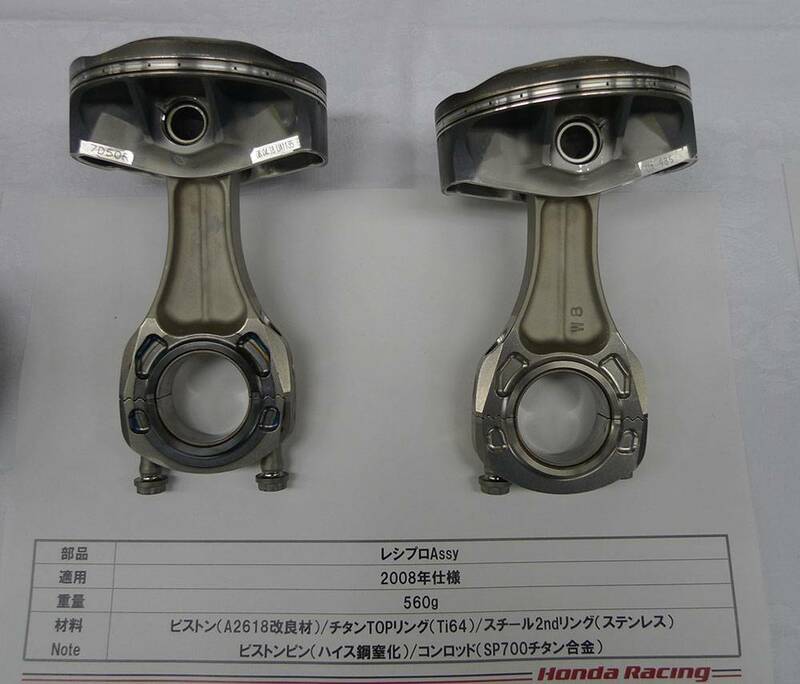 Piston included for comparison to the current gen.
Orphans: I can't link these to a year or car. 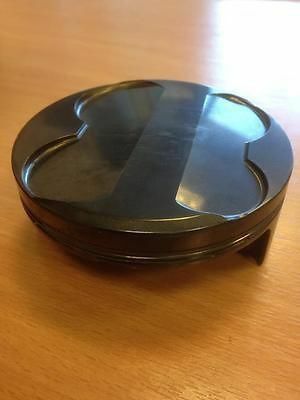 Any info here greatly appreciated. 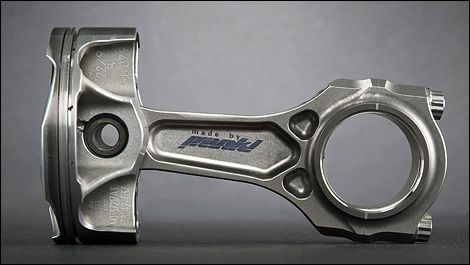 Pankl "Mystery Rod #1": I thought this was just a 'demo' piece, but the autograph on the piston makes me think it was 'real'. Lack of serrated cap location says 2005 or earlier vintage. Pankl "Mystery Rod #2": This one only shows up in their annual report. It may not be 'real'. The organic shape is sure a contrast to Mystery #1 above. Again, the lack of serrated cap location says 2005 or earlier vintage. Pankl "Mystery Rod #3": This is also something from their annual report and again may not be 'real'. Interesting form though. Ditto for the lack of serrated cap location saying 2005 or earlier vintage. 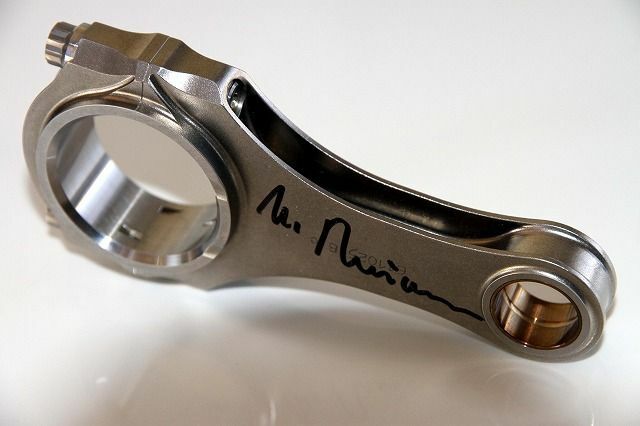 Pankl "Mystery Rod #4": This was on a Japanese collector site and is supposedly a BMW F1 piece, autographed by Dr. Mario Thiesen (spelling?). 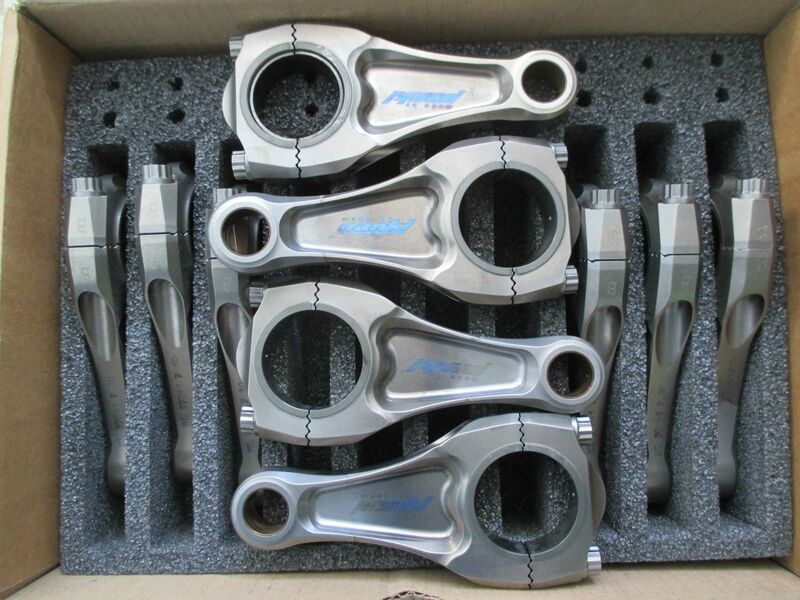 These look like steel to me. Again, the lack of serrated cap location says 2005 or earlier. Please chime in with insights and commentary. If you have more images please do share. I didn't intend for this to be a Pankl-fest, so please share other manufacturers if you have info. Last edited by e36jon on Tue Jun 26, 2018 9:24 pm, edited 26 times in total. you didn't upload the pictures correctly. 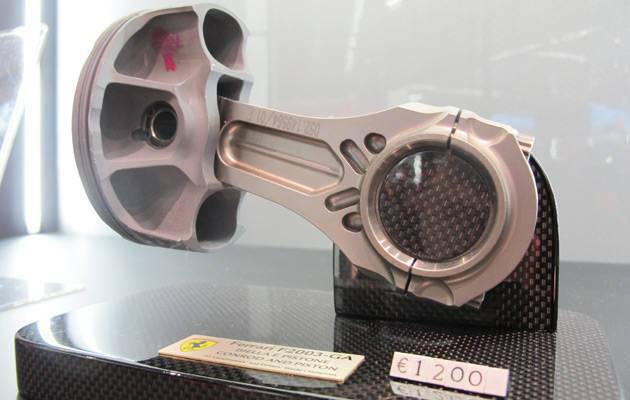 I'm very curious about the ferrari piston and rod. Maybe you could check that again. When you quote a post, the links somehow become clickable. 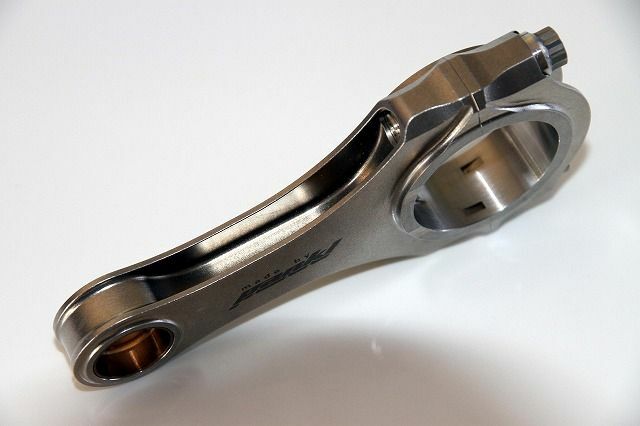 - The wrist pin seems to swim at the contact points to the piston, otherwise I wouldn't understand why they would shrink in a bronze bearing in the piston. - The rods are obviously waaay heavier than on he previous engines. 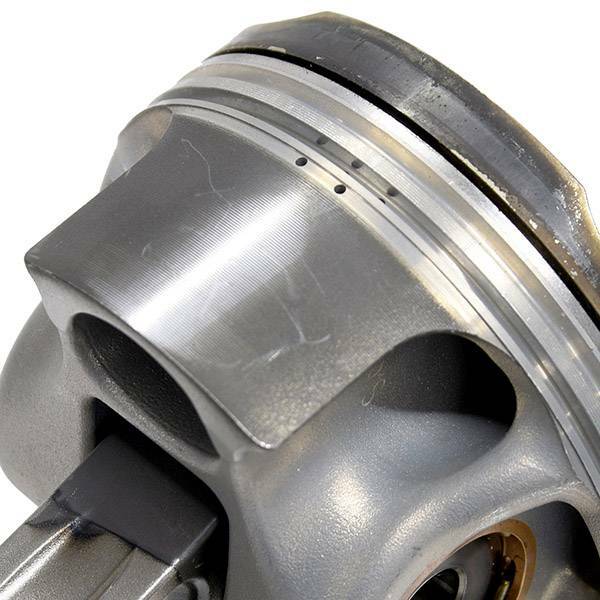 - Piston skirts are coated with Molybdenum or DLC, just as expected. - It can be marks from the manufacturing process, but I think it's on purpose: The skirts are ribbed to reduce friction and allow oil to stay between skirt and the liner. 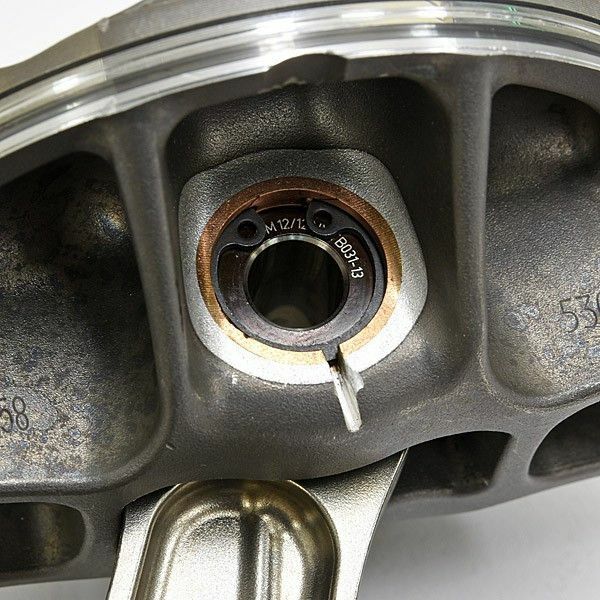 - I don't know if this is from a engine with pre-chamber technology, but it seems that the injector is centered and the spark plug also is very near to the center, but to be true I even think this is a pre-chamber piston. 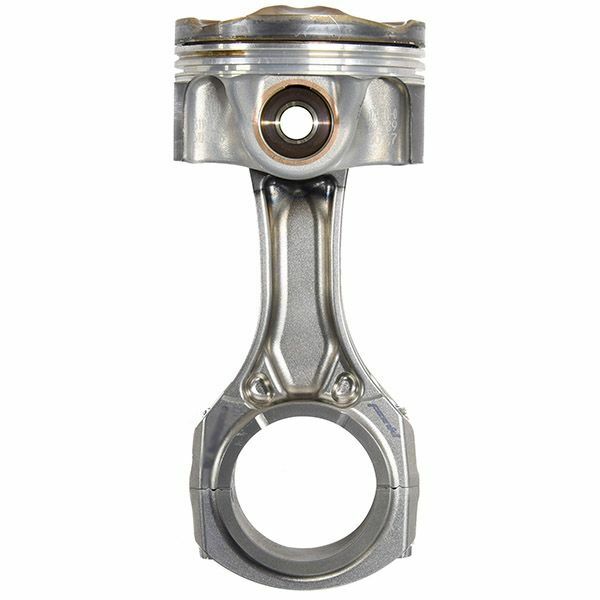 The sides of the piston are extremely high, they probably reach up to the cylinder head surface, they have the pre-chamber in the center and want to isolate the flame from the liners, just like expected. However, the burning marks are a bit contrary to the pre-chamber thing because it seems like flame propagation wasn't starting from the center. - Two compression rings again, but that isn't surprising when you think about lower rpm and way more cylinder pressure. - The valves are way smaller than with the 2.4 Liter engine, they are also extremely wide spaced, there is so much space for interesting technology in the center. Thanks for all of the insight glenntws! I just added the last few images from the Japanese site. One thing I noticed is some new-to-me machining for locating the rod cap. Wish they had opened that joint up, which is greedy given all that they did show. 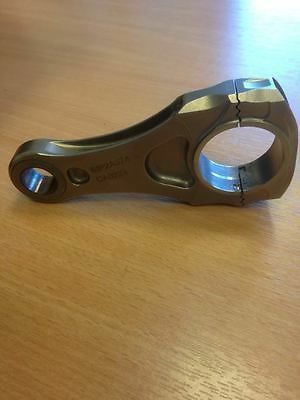 Anyone ever see the machining in question before? Any images of what that looks like 'open'? 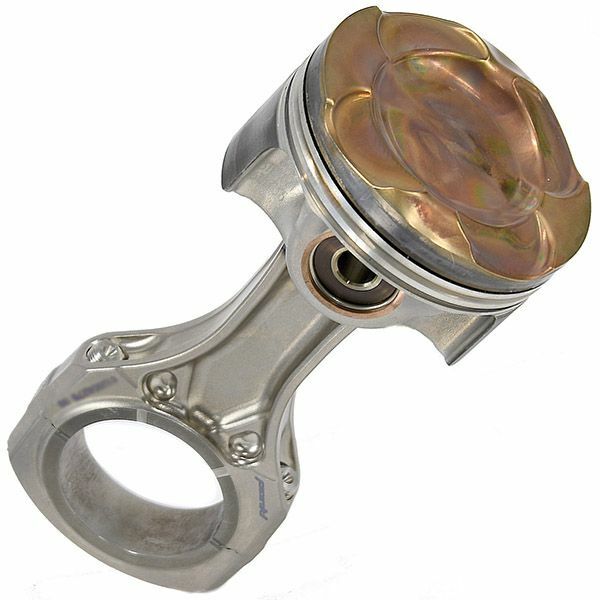 I agree the piston may be the more interesting piece here. I thought 'diesel' when I first saw it, which is seemingly true some of the time... Looking at the valve pockets it looks like the valve layout is 'radial', or inclined in two planes. That's a pain for cams and followers and such, so given the higher required mileage these engines will see I wonder what the payoff is? In the past, with normally aspirated engines, you could pick up some flow, and maybe a 'better' combustion chamber, but with forced induction it doesn't seem as obvious to me. Thank you Jon, great stuff. 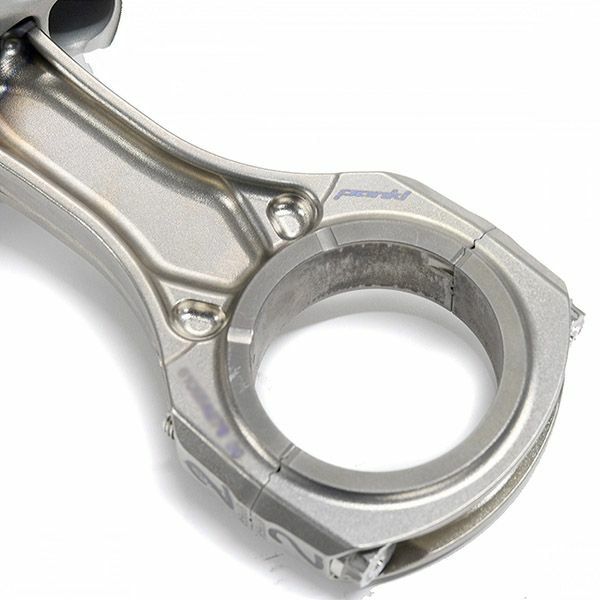 I have been designing high performance rotating and reciprocating engine components for quite a while and I've had the chance to work closely with Pankl. 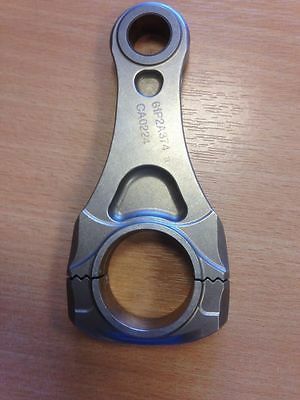 I'd also worked at Mahle for a few years, mainly at their site in Rugby (which used to be Vandervell bearings) and mainly on motorcycle engines. 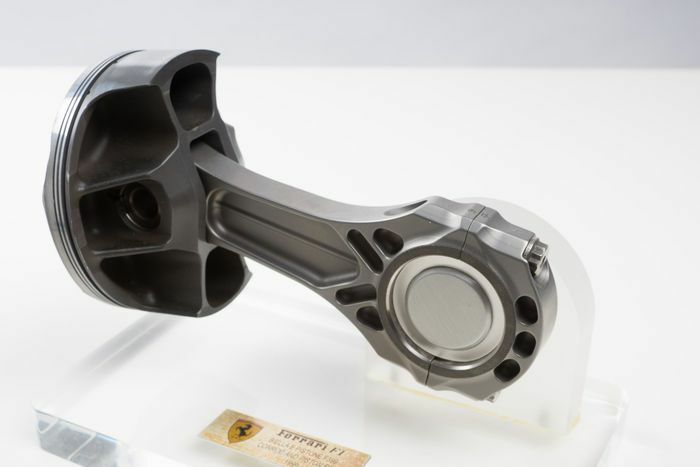 I am a bit suspicious regarding the authenticity of the Ferrari V6 bits, however having visited the Mercedes restaurant at their engine site in Brixworth where they have a V6 turbo piston on display I have to say that the proportions look spot on. 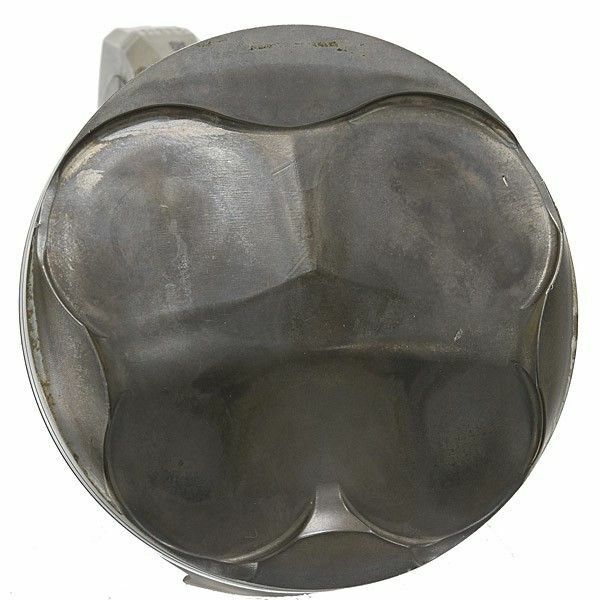 Unfortunately the Merc piston is positioned such that only the crown, skirts and pin bores are visible, so no clue what it looks like from below. 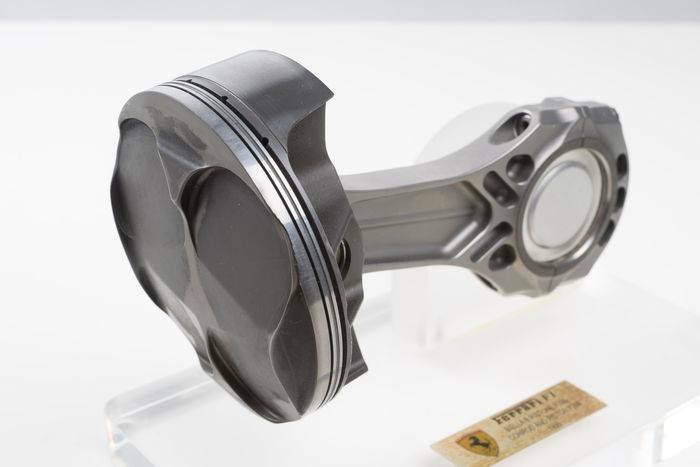 The (allegedly) Ferrari piston looks outstanding and the complexity of the oil pockets/gallery is impressive, even though it means that the piston cannot be forged. 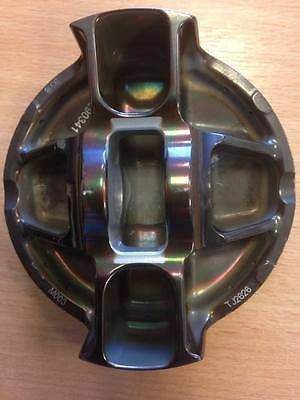 At the same time I am surprised about the poor finish given that even older F1 V10/V8 pistons had very well finished under-crowns. I think Cosworth VJ was Ra 0.8 or so. The wear pattern on one of the skirts (presumably thrust side) does not look right, with signs of contact at the sides and bottom edges. 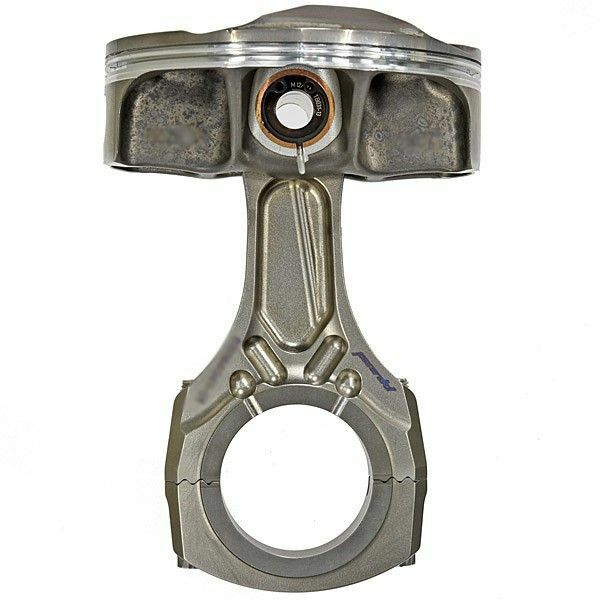 There does not appear to be any visible sign of land contact which is commendable given that the piston looks quite top heavy and runs at high speed and high cylinder pressure. It could be that the lands are cut-back aggressively (which is bad for crevice volumes at the top land, particularly with what appears to be a very low compression ring). 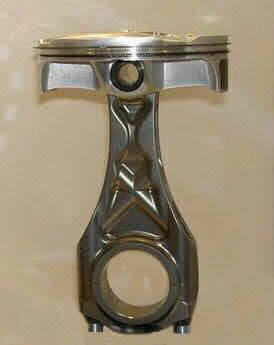 The compression height is quite large which is why I was saying the the piston appears top heavy. 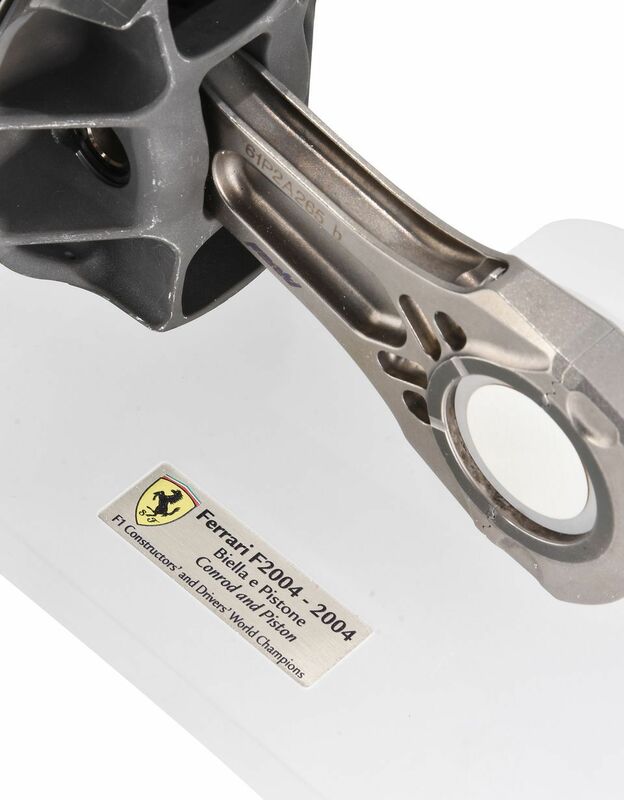 In addition there's rumors that Ferrari have started using a steel crown insert after their failed attempt at 3D printed steel pistons. It's hard to tell because of the carbon deposits and the crown coating (which seems to be some form of ceramic thermal barrier). The skirt coating is most definitely not DLC (it is known to weaken piston skirts) but rather some form of moly/graphite. Since it is known Mahle have been involved, I would put my money on their proprietary graphal. By contrast Cosworth have always sworn by their green Xylan coating. No accumulation grooves visible on the second land (probably not needed with aggressive cut back) and more interestingly - no visible top groove gas ports. Gudgeon pin is most likely DLC coated with a straight bore. It is not uncommon to profile the pin ID to help balance the pin stresses, so I am a bit surprised by that. 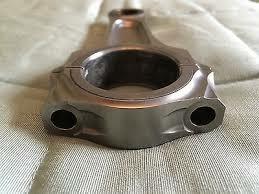 But then again, Cosworth used to run a straight bore pin at over 20k RPM so maybe it's not necessary. 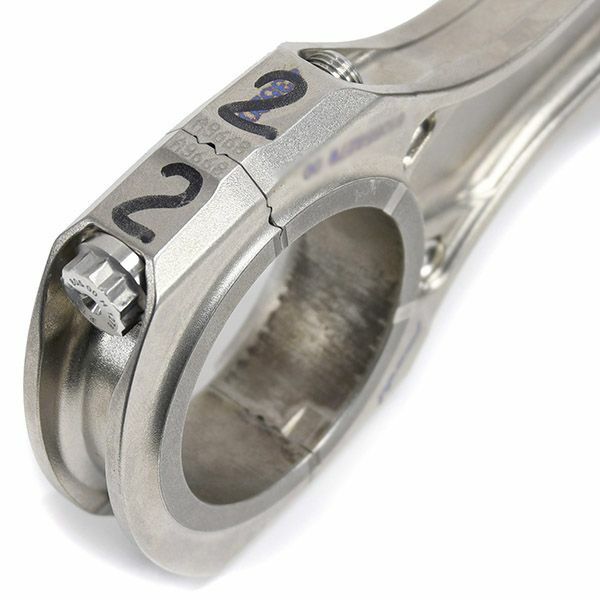 Notably the circlip has nicely rounded ends so that it does not dig into its groove. 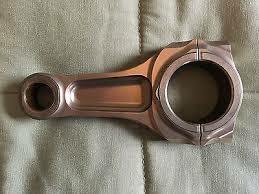 The bronze bushing is fairly standard and I would expect there to be one in the small end too. Onto the mystery of the rod serrations - these are perpendicular serrations designed to prevent both lateral and axial relative movement. It is a proprietary Pankl design as far as I am aware. 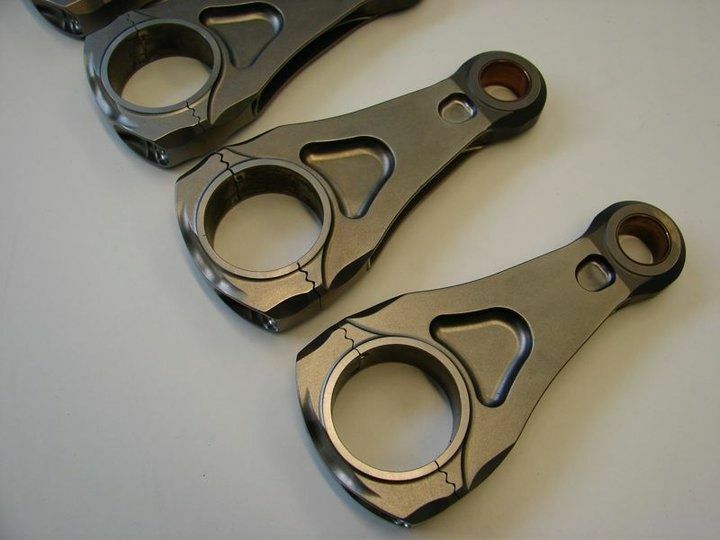 Titanium has very poor tribological properties and is therefore very susceptible to fretting and galling. It is also hard (if not impossible) to fracture split so the only available options for preventing relative movement between rod and cap are serrations. 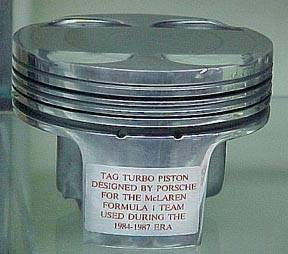 F1 V8 engines relied on standard axial serrations and dowels (standard ones rather than the more common ring dowels). It is now believed that dowels are not particularly effective at stopping axial relative motion. The "elephant in the room" is the heat discoloration around the small end - can't really work out what is going on there but that doesn't look as something that should ever run in an engine! 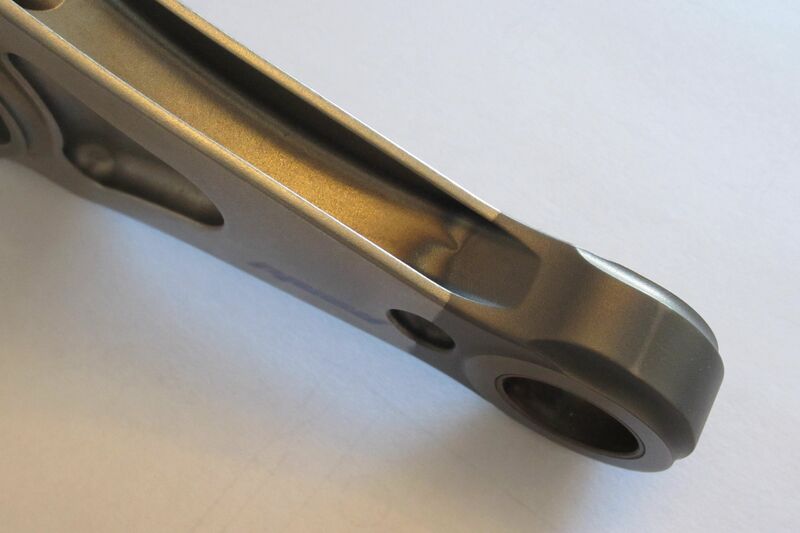 Interestingly the rod thrust faces have bearing oil drain grooves in them which is indicative of a crank guided rod. 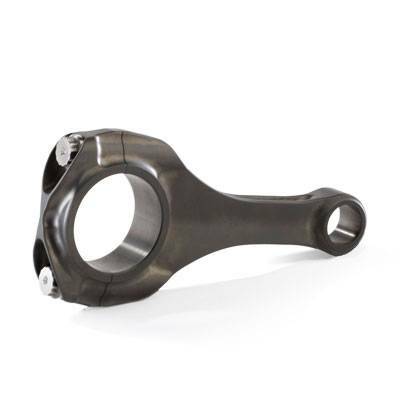 Traditionally F1 engines have used piston guided rods since the friction torque is smaller (due to the smaller contact radius at the small end thrust face) so rods have not required drain grooves since there was always clearance between the crank shoulder and rod face. Again the coating on the rod thrust faces seems to be moly based as usual. 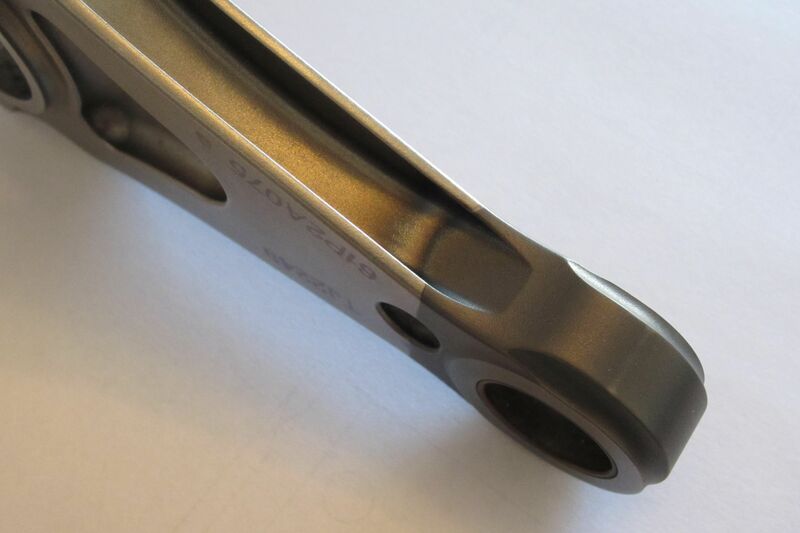 The rough looking big end bore surface is a testament of the poor tribological properties of titanium. 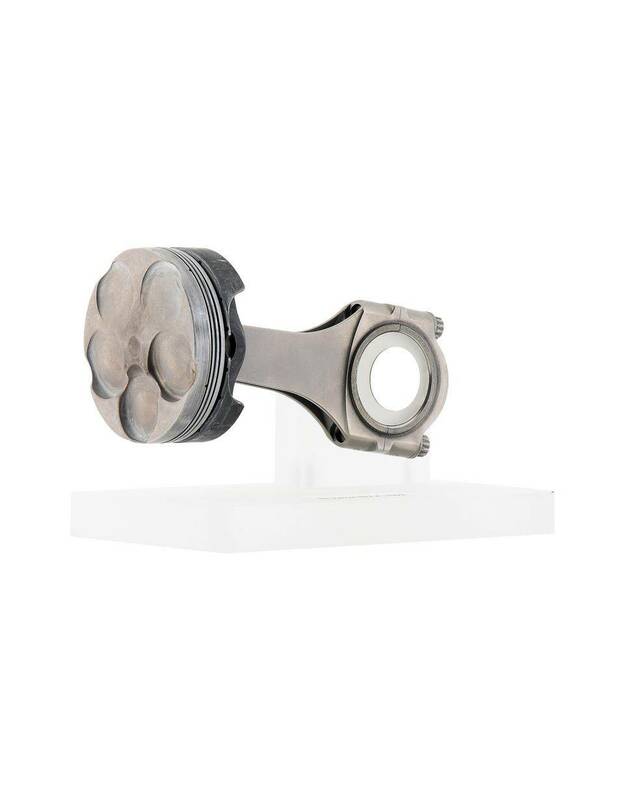 It was common in the V8 days for rods to fail from fretting initiated between the back of the bearing and rod, particularly with steel-backed big end bearings which prompted some manufacturers to start using plain bronze bearings. 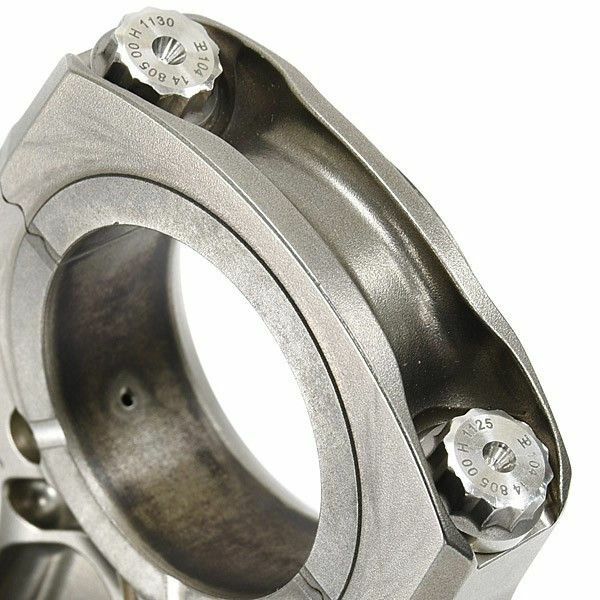 These tend to be better at dissipating heat generated in the bearing at the expense of a higher coefficient of thermal expansion compared to titanium. (Steel CTE is much closer to Ti than bronze). 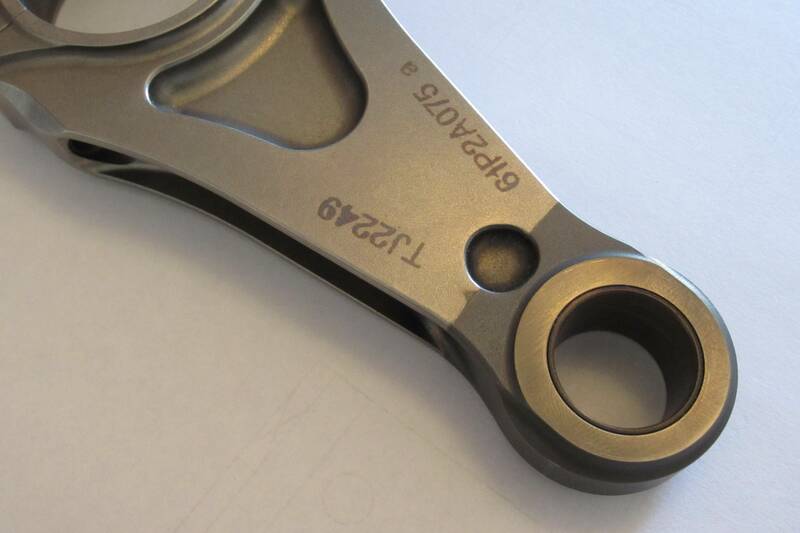 A very important feature that Pankl are very particular about is the large fillet around the thread break-out. 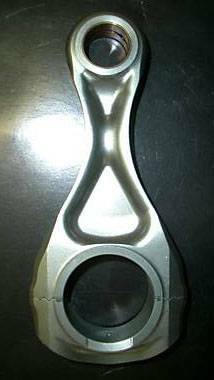 The last engaged thread is exposed to the highest alternating stress and the fillet is designed to improve the fatigue life of that region. 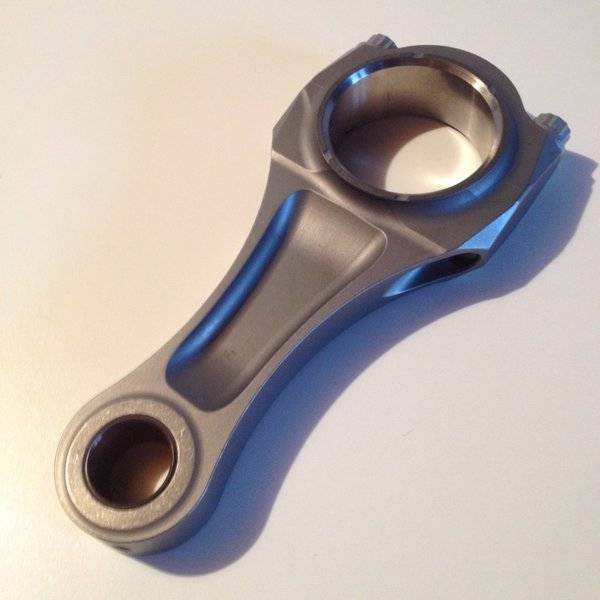 The rod cap parallel ribs are a dated feature that I do not agree with since it tends to over-stiffen the bearing edges. A better design in my view is ribs that converge into a single rib towards the middle of the cap (Pankl also offer this). 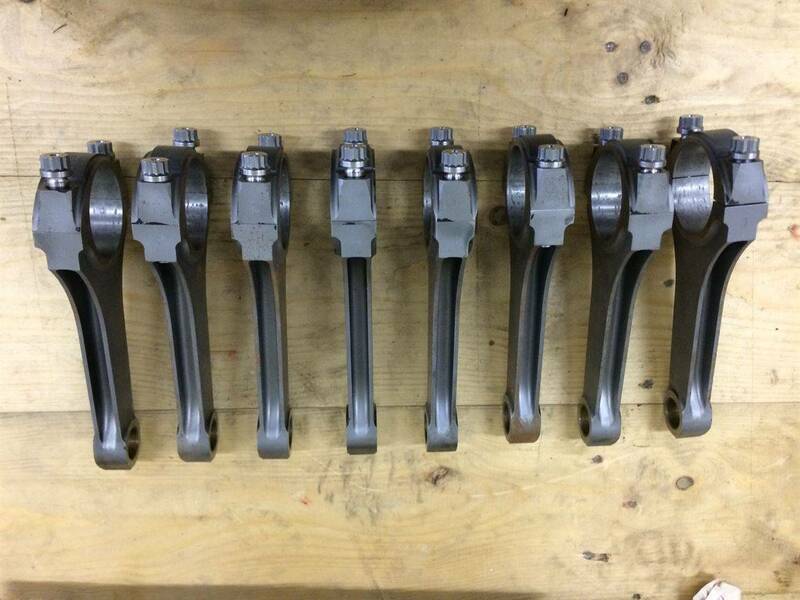 Overall the rod big end looks pretty flimsy compared to old V8 rods. 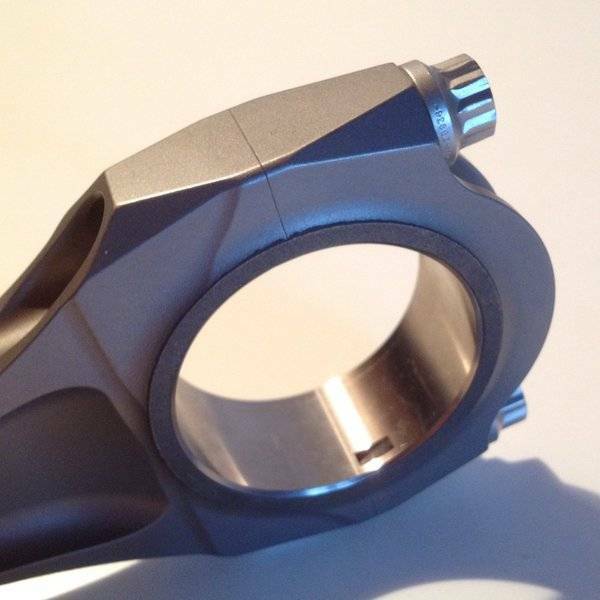 Given that titanium has half the steel's Young's modulus, I would have expected the big ends to be really beefy. Last edited by Mudflap on Wed Jun 13, 2018 10:36 pm, edited 2 times in total. 1) The heat discoloration at the small end of the 1.6L rod looks like the surface treatment on the Pankl Cosworth TJ rod that I have. 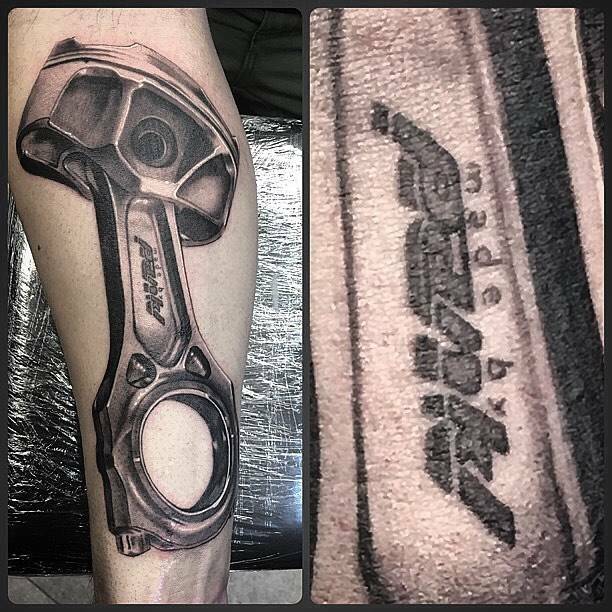 You can see it in the first image for the Cosworth V10 rods above. Are you seeing heat discoloration above and beyond this surface treatment? 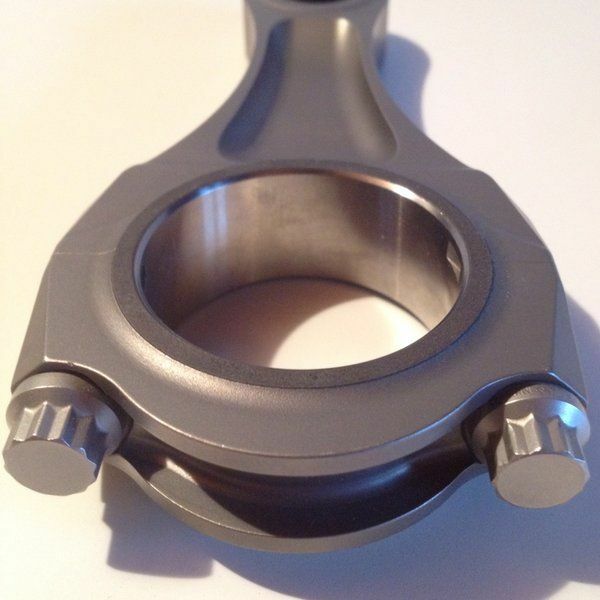 2) I was also surprised at the straight-bore wrist pin. Not unusual, but with the F1 crowd I always imagine every gram having a target on its head. 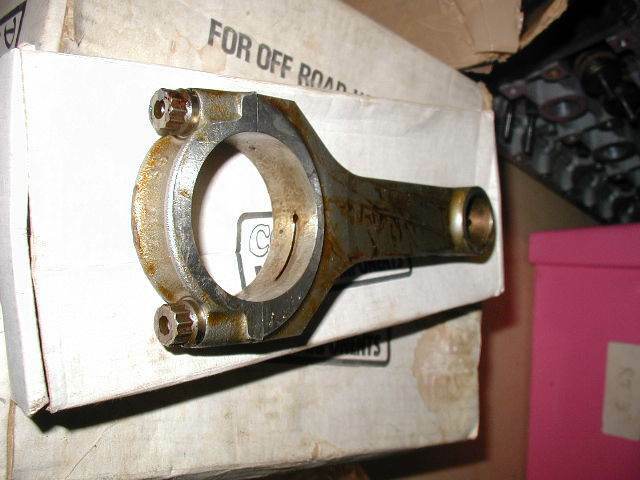 3) My TJ rod was run, and like 1.6L rod the inside of the big-end bore is not pretty. I also have the 'early' version with pin-location for the cap and the tall paralell stiffening skirts on the cap. 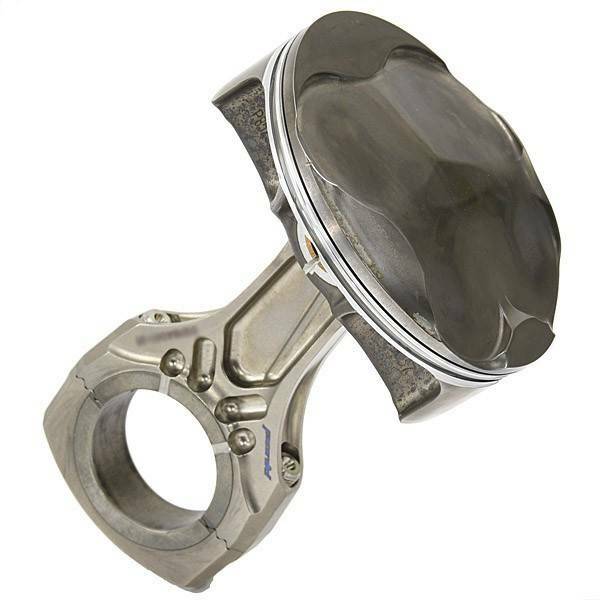 5) A piston question: On the TJ piston (Example below, with hand cut windows.) and the 1.6L piston there are windows cut into the 'bridges' on either side of the pin, between the underside of the dome up into the bridge. 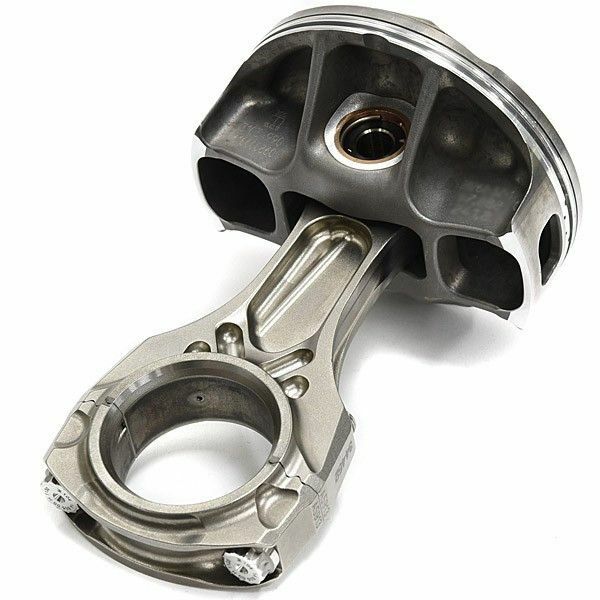 On the TJ piston I assumed for weight reduction, but the 1.6L piston is a beast so that doesn't seem like the reason. Thoughts? Sorry to reward your great post with a bunch more questions! The need for big-end strength is perhaps more closely related to rpm than power or specific power. The V6 turbo engines are much lower revving and also see much less negative force at TDC exh due to high gas pressure. 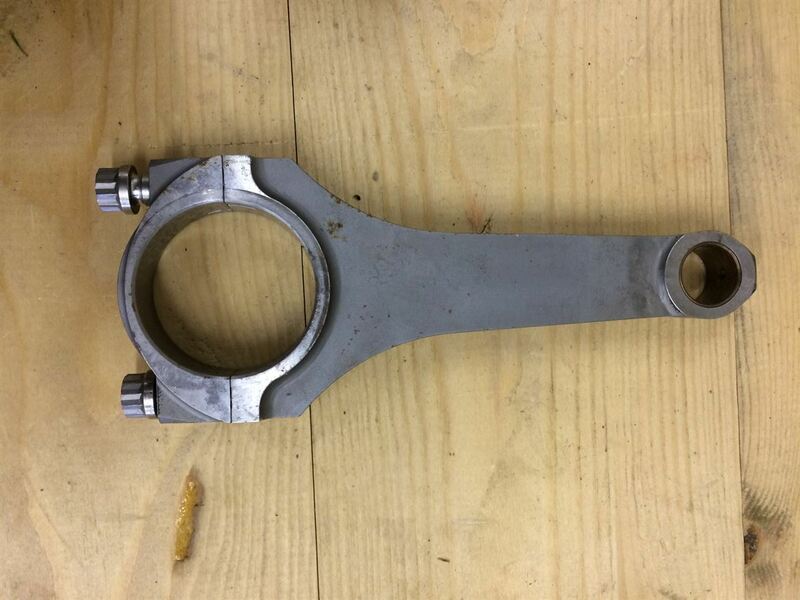 Cool finds there e-jon, ta..
About the piston in the 1st post.. ok, you've confirmed the 'radial 4V' speculation ( discussed here recently). but is that comp-chamber face.. golden top-coat - a thermal insulator, calalytic-burn interface, deto-resistor.. or all 3? & the top ring land zone is interesting.. as is the very slender (absent its Napier 'wedge' type ring?) 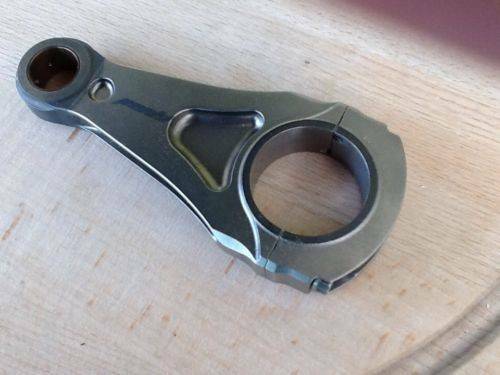 - ring fit..
For sure the smoothly 'organic' piston shape is self-evidently - a robust/durable form..
& g-g is - as usual - correct about the conrod functional design parameters..
For super high rpm light alloys have inherent elastic 'give'.. at the price of a shorter TBO - 'life'..
Greetings J.A.W., it's great to have you here. It's hard to tell because of the carbon deposits and the crown coating (which seems to be some form of ceramic thermal barrier). He also mentions that if this is real it's certainly not current, as efforts all around are to use steel / something other than aluminum. 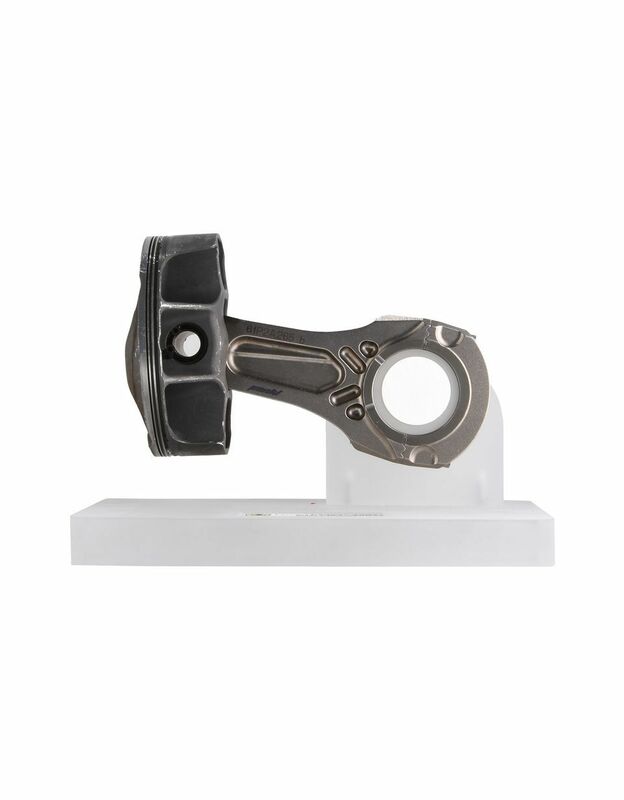 There does not appear to be any visible sign of land contact which is commendable given that the piston looks quite top heavy and runs at high speed and high cylinder pressure. It could be that the lands are cut-back aggressively (which is bad for crevice volumes at the top land, particularly with what appears to be a very low compression ring). Would appreciate a link to the radial valve discussion as I missed it. Ditto for letting me know if all of this is being discussed elsewhere. If it doesn't show up on the main page in the active topics I am probably not aware of it. 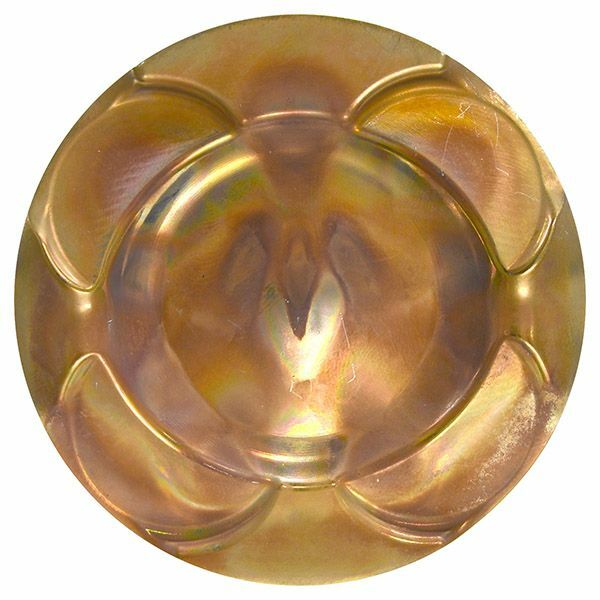 You can clearly see the flame propagation is from the edge of the bowl inward, and you can see this is because the highest concentration of coloration is in the center. 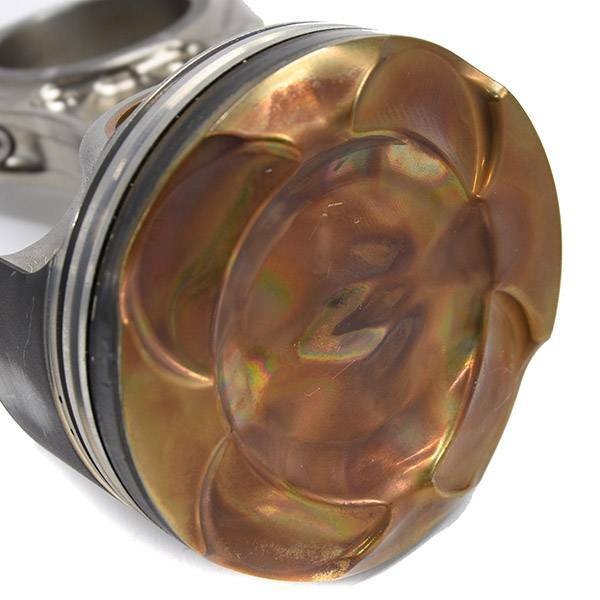 In normal combustion methods the coloration is at the piston edges. One thing I found impressive is how well that top ring seals, I don't see any blowby whatsoever. I put up the last of the images I have in the first post. If you have something that's not there, or additional images, please put them up! Also, with all the newness I have additional questions about which version came first, etc. As ever, your collective wisdom would be appreciated in getting my facts sorted. "Hi, my name is Jon and I have a conrod problem..."
The "rainbow" pattern at the interface between the coated portion of the small end and the uncoated shank does not look right. The most common small end coatings are CrN (with deposition temperatures of max 350°C which I've never seen to change Ti color to such an extent) and various Mo compounds with deposition temperatures of about 150°C. TiN has also been used (goldy looking, not the case for this particular rod) and it has similar deposition temperatures to CrN. No idea, sorry, probably not in production engines anyway. 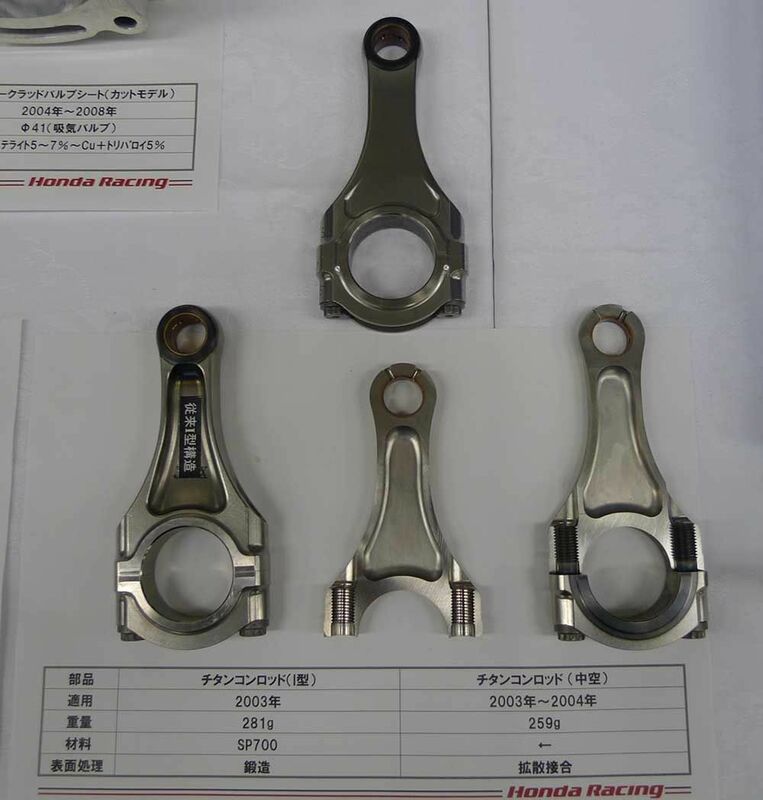 Pankl tend to offer their customers very similar products so I would not be surprised at all if this joint turned out to be common across most F1 manufacturers. 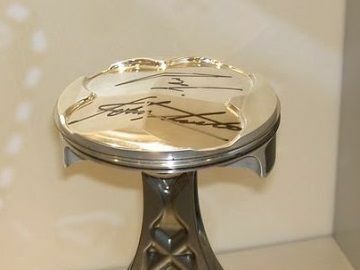 The main purpose (if not the only one) is to provide oil access to the underside of the crown. 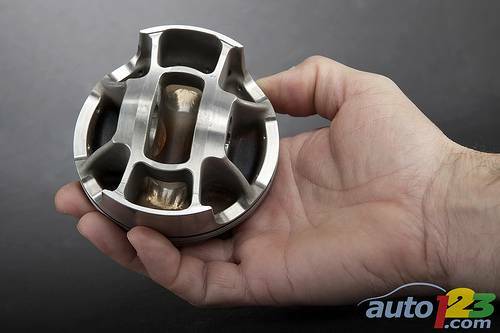 Every square millimeter is very precious in managing the temperature of Al pistons. This task becomes very difficult when thick ribs get in the way and is another reason why I think steel pistons have an advantage. Even though the heat transfer coefficient is much poorer, the larger wetted undercrown surface (thinner ribs) and higher temperature fatigue strength more than make up for it. Looking at the the skirt and pin pockets it is obvious that great effort was put into providing good oil access to the undercrown. 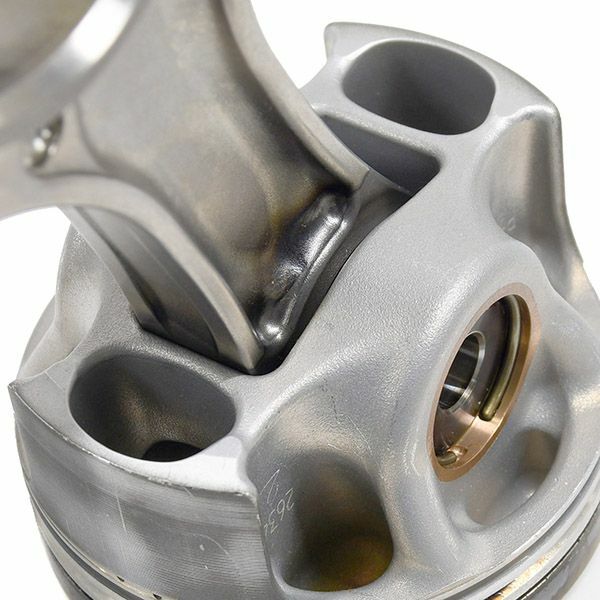 The entire underside of the piston is saturated by multiple nozzles - at least one per pocket. In my opinion that "windowed" rib parallel to the pin axis is not really necessary. The main bending load is about the pin axis and is taken by the ribs supporting the skirt, not the ribs perpendicular to them. As long as the small splayed gusset ribs are well designed to stiffen the pin bore the "windowed" rib (I think it is sometimes referred to as a T rib) is not required. You think the green is some chlorine compound, maybe combustion residual?